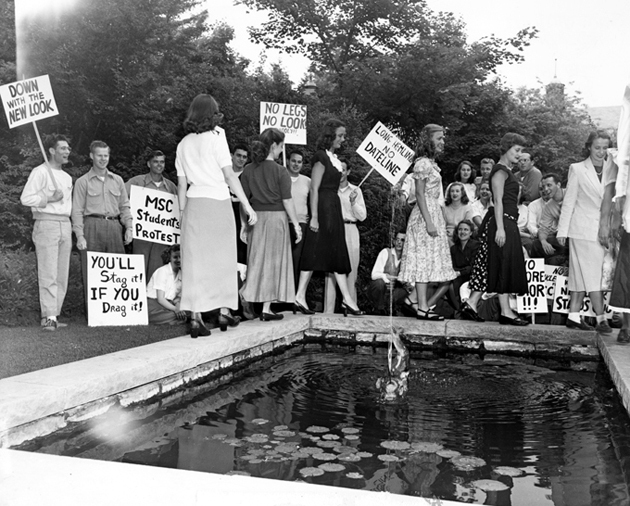 Male students protest against longer hemlines at Michigan State University, circa 1947. When a friend of mine posted this photo on my Facebook wall some time ago, I immediately thought this was one of the most interesting moments in fashion history I've heard of. 1947 was the year Christian Dior introduced the "New Look" in his groundbreaking Spring/Summer collection - the silhouette would have small waist, large bust and - you guessed correctly! - long skirt. If the photo really had been taken the same year (Dior presented the collection in February), the New Look must have paved its way across the pond rather quickly. I don't think people should tell others what to wear unless asked to (and yet, I love fashion, guilty of the very same "omniscience" ... the irony! the contradiction! the beauty of it all!). Kevyn Aucoin nailed it in one of his make-up tutorial books: "Those who create rules for others are often insecure about themselves and control freaks." I wish we knew more about the context of this photo (or is it that being from a different culture, I cannot read into it in more detail?). Only then would it be clear whether the hemline protest was a clever, dallying joke or meant very seriously. You know what, it wouldn't surprise me if this was even half way serious. I don't wear shorts of any kind (hemlines, sleeves, necklines, etc...) and you wouldn't believe the at times the rude things said to me about it from other women. I think it was one of Valerie Steele's book "Fifty Years of Fashion" about the new look getting a lot of criticism at the time period, because the "excessive" usage of fabric was controversial at a period of war time rationing.